AirSep Medical Oxygen Systems offer unsurpassed reliability, control, and continuous on-line oxygen concentration and pressure monitoring to ensure an uninterrupted supply of medical-grade oxygen. Average, as well as peak oxygen demand periods, are easily supplied. 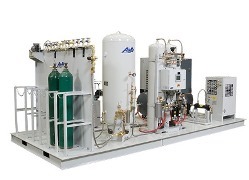 Any AirSep Oxygen Generator can be packaged with other customer-specified or AirSep-recommended components to form complete Medical Oxygen Supply Systems including automatic switch-over. In the unlikely event that the system deviates from preset limits, the automatic switch-over immediately switches to the secondary oxygen supply. System alarms alert the health care facility of the condition so that corrective service may be performed. For customers who require portability or desire to supply oxygen to others, the cylinder filling option allows for the filling of as few as 8 to as many as hundreds of cylinders per day at up to 2,200 psig (15,170 kPa). If a self-sufficient secondary oxygen supply is needed, cost-efficient oxygen compressors designed to fill cylinders intermittently are available. AirSep also offers weatherproof and duplex systems (two independent systems with manual or automatic switch-over). For special applications, a high concentration module can be added to the system. AirSep Medical Oxygen Systems are currently in use in more than 30 countries around the world and have been designed and supplied in accordance with the following Medical Oxygen Standards: USP XXII, CE 93/42/EEC, CSA, HTM2022, and the Argentinian Medical Oxygen Standards. AirSep Medical Oxygen Systems meet ISO10083 and ISO7396 criteria for Oxygen Pressure and ISO8573 (Class 1.4.1) for Air Quality.